In stock in select colors (others are special order). Call or chat for fastest shipping models. Have you considered a matching accessory? Choose one of the following: the simple Swing Table, the ultra-convenient Personal/Laptop Table, the useful Ellipse Table, the stylish Urban Table, or the fan-favorite Elevator Ring set. Looking for Stressless Deals? Our Ekornes Authorized Price Reduction Sale is Going on Now! Paloma leather has quickly become the most popular leather to purchase the Stressless Wing Recliner in, due to its luxuriously soft touch. 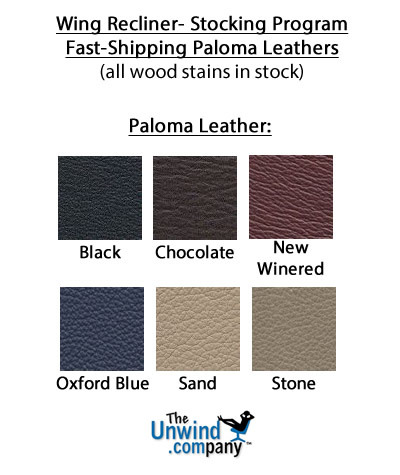 To view any of the amazing Paloma leather colors or any of the other leather or fabric types and colors, simply use the pull down menu above, which is titled: "Select Leather or Fabric Type and Color". The price of the Wing Recliner will change based off of the leather or fabric type and color chosen through the pull down menu. Looking for a leather or fabric type and color that is not shown on the pull down menu? Call 888-486-9463 to speak with an Ekornes Furniture Specialist about the Wing Recliner or any of the other amazing products offered through our website. Standard pricing is reflected automatically when you make your leather/fabric selection from the swatches above. Need assistance- Please call 1-888-486-9463. Enjoy Fast, Worry-free Delivery on a Stressless Wing Recliner and Ottoman. Start relaxing in your beautiful new Wing Recliner and Ottoman sooner with our Quick and Easy Shipping Methods. It's a great time of year to purchase from the amazingly comfortable, Stressless Wing Recliner line! This popular, modern recliner delivers exquisite head, neck and back support and the over-stuffed smooth, soft, cushioning allows you to sit undeterred for many hours on end. The Stressless Wing recliner is among the most modern and padded Stressless recliners available. Choose your preferred leather or fabric type and color by using the pull down menu above titled:"Select Leather or Fabric Type and Color". Then choose from the beautiful wood stains. Typically, we keep all wood stain colors in stock. Follow the on-screen instructions and you’ll be relaxing in your new Stressless Recliner before you know it. We also delivery Fully-Assembled, Brand-New items right through the front door of your business or home with the Fastest Shipping Methods available. Our Quickest Delivery Options can have Recliners in stock for Immediate-Shipping delivered to virtually anywhere in North America in 1-5 business days. There's no need to pay for standard shipping when you can have Priority Shipping at no cost. All of our items are backed by the rock-solid 10 year Manufacturer's Warranty at no additional cost. You can truly relax and unwind when you choose the world's most advanced recliners. From the patented technologies, to the outstanding construction and engineering, down to the incredibly useful accessories, you will be able to relieve stress and tension and promote a genuine sense of well-being in this seating solution. 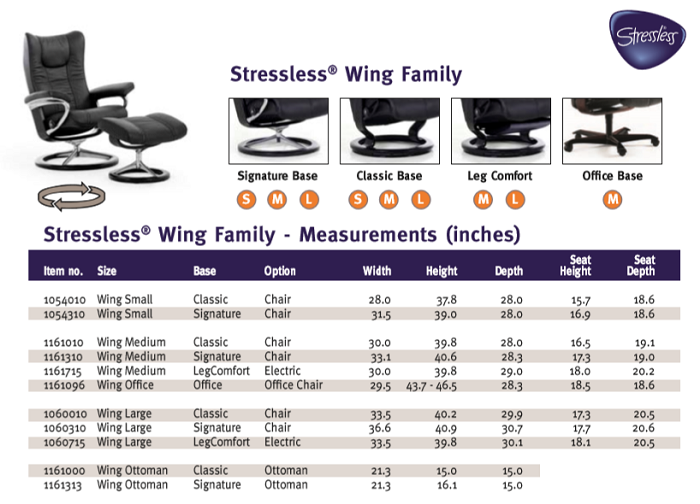 It is certainly a marvelous time of year to purchase from the distinguished, comfortable, Stressless Wing, Eagle lineup! This popular, comfortable recliner series insures consistent head, neck and back support and includes soft, smooth cushioning. The Wing recliners allow you to sit without strain or sore muscles for countless hours on end. Also, take a good look at the professional- inspired Wing office chair. The Wing Recliner is a crowd favorite. The elegant design and name lend itself to the traditional wing-backed chairs of the past. However, the Stressless take on the Winged Recliner is a brand-new one. They bring adaptative lumbar support to ensure proper, lower-back support in all angles; 100% premium Top-Grain leather which is among the finest in the world; and the Plus System™ to ensure that once you are reclined, you can take it one step further into a comfortable and natural, healthy sleeping posture. There isn't a better recliner than an Ekornes Stressless. There isn't a better place to shop than at Unwind. Would you prefer to receive your Wing recliner faster? Choose one of our other speedy delivery methods. 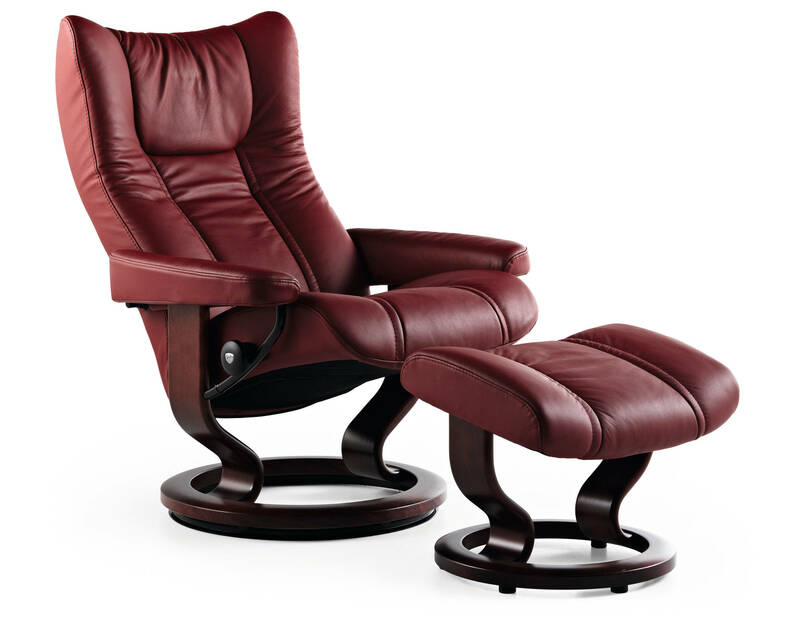 Soar Into Comfort with the Stressless Wing Recliner and Ottoman from Ekornes. Select Inside or White Glove Delivery at Unwind.com. Smooth, windy curves and perfectly-padded support comfort sections with a sophisticated stature, the Stressless Wing Recliner can bring clouds of comfort into your living room, office and everyday life. Your back, body and mind will fall in love with the flowing, supportive relaxation that you experience everytime you "land" in the Stressless Wing Recliner. Like its larger brother (the large Stressless Eagle Recliner), the medium Stressless Wing recliner, is a mid-priced addition to the Stressless recliner lineup from Ekornes. The Wing recliner offers the Patented Plus System for constant comfort and is so stylish and sophisticated that it will blend-in to almost any family room, game room, or even the home office. Yet it still manages to bring home the same back and neck-saving features that Stressless Recliners and Ekornes sofa's are known for throughout the world! The Stressless Wing offers great comfort and support- especially to individuals who fit the small-to-medium size characteristics (the warranty is valid for weights up to 350 pounds). We invite you to glide in, sit down, kick-up your feet and take the Stressless Wing for a test-flight- You'll be glad you did! Add a handy Stressless Swing Table, Stressless Accessory or Laptop Table, or a plate-holding Ekornes Ellipse Table, and you might find yourself yearning to work a bit more from the house these days. Why not save fuel and reduce back strain at the same time? Come visit the Unwind Back & Body Store to experience the Stressless Wing Recliner for yourself. It's always easiest to pick the perfect Stressless recliner if you have a chance to sit and relax in them for awhile. If you have already decided and are ready to purchase, simply click the "Add To Cart" button below after selecting from the available options. We will ship your recliner assembled in the contiguous United States (and much of North America). Please review our return policy prior to ordering or call 888-486-9463 for personal assistance. International callers please dial 1-601-932-5111. You may also email stressless@unwind.com anytime- 24 hours a day, 7 days a week. We have a number of Wing recliners in stock and in multiple locations which allows us the ability to ship your recliner extremely fast and have it delivered quickly to both coasts. The Unwind Company currently offers same-day delivery to almost 70 cities across the United States. Due to the time-sensitivity of our Unwind Express Delivery Service, we are currently unable to process these orders online. Please call 1-888-486-9463 and you can be enjoying your Stressless recliner so much faster than you ever imagined. Of course there are some restrictions on this service and sadly, it is not available everywhere. Not in this much of a hurry? We offer many other full-service delivery options as well. The best part of our extensive delivery choices (aside from the great service) is that almost all are completely RISK FREE to our customers. A stress-free shopping experience has been our #1 goal for more than 10 years! - The easily-moved ottoman also features a built-in tilt system that adjusts to your body movements for the ultimate in leg comfort. - Stressless Recliners and Accessories are built to last for many, many years. A round base and double-stem support ensure stability. -Stressless Recliners are created for a custom fit- Many of these recliners come in three sizes (small, medium or large) and many sofas are available in two sizes (medium or large). The Wing recliner is the "medium" recliner in the Wing, Eagle Stressless line. It is no surprise that Stressless Wing Recliners are Exclusively Endorsed by the American Chiropractic Association (the ACA). Have questions or need additional information about the medium Stressless Wing recliner or other Ekornes furniture? Please contact us at stressless@unwind.com or at 1-888-4-UNWIND (888-486-9463). We're here to assist you with your Stressless Wing or other Soothing Back Product or Furniture purchase. After researching for what seems to be an eternity we chose the Wing model. It seems to have the most traditional look and matches our home perfectly. Thanks for delivering so fast too!